My little baby, S, turned 2 last week. I swing between thinking ...man...she can't be that old already.. ..to...she's already 2 ? I don't want her to not be my baby any more. But as all moms say, they'll always be my babies. I asked S , a few weeks ago what kind of party she wanted and showed her a catalog of birthday supplies that I got. She immediately pointed to Caillou. For those that don't know, Caillou is a show about a bald little 4 year old boy, his mom, dad, sister Rosie and cat, Gilbert. Caillou is always learning how to be a good boy and grow up. We watch the episodes that are on the Sprout channel which is an off shoot of PBS. There are other episodes I've seen where Caillou is much more whiny and a pain but they are never on Sprout and I don't know why. As always , we have a tight budget so I knew I was doing everything myself. I grabbed some clip art off the internet and then made this file in Photoshop. ( I can send you the file if you want. I haven't figured out how to make it downloadable here) Then I sent it to Walgreens and had it printed as 4x6s. So $2 for all the invites. Score! 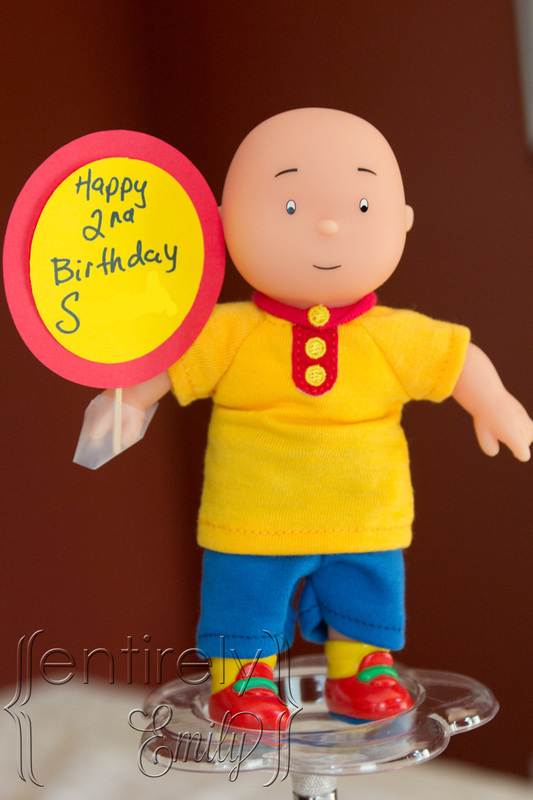 Caillou is always wearing yellow, red and blue. A nice easy color combination to do and available everywhere. Since I did the colored circles on the invitations , I went and cut out, using my handy dandy circle cutter from Micheals, a whole bunch of red, yellow and blue paper circles. The pack of colored printer paper was $4 at Walmart. I also bought a tiny 6" tall Caillou plush/plastic doll at ToysRUs. I figured it was double duty decoration and toy when the party was over. The dessert portion of the party was cupcakes and ice cream. So I made vanilla cupcakes with chocolate butter cream icing and chocolate cupcakes with vanilla cream cheese icing. The cupcake recipe was from Tidy Mom. And they really were very good. The chocolate butter cream recipe was from the back of the C&H powdered sugar box. Very tasty. And the cream cheese icing recipe was from the Betty Crocker (everyone has it ) binder cookbook. I used a cupcake holder that my mom always lets be borrow. To go with my primary color/Caillou, theme I also bought some M&Ms. After I was done icing the cupcakes, I sat there, picked out the red, yellow, and blue candy and put them on the cupcakes to match the paper circles. 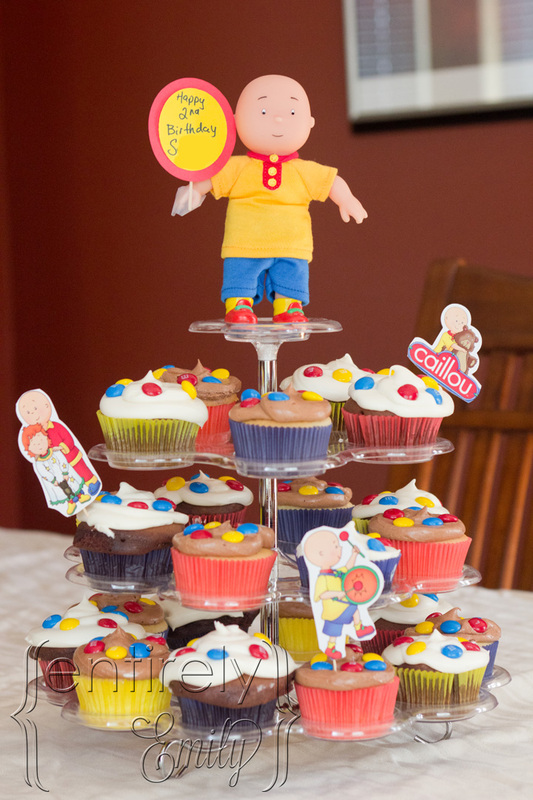 I also cut up the box that the Caillou toy came in , taped the images to toothpicks and added them to the cupcakes for more fun. I went to the party store by our house and got a bunch of balloons in red, blue and yellow. Some even had a 2 on them. When I was at Trader Joes, I also picked up some gorgeous yellow sunflowers to go with my theme. I went downstairs and started slapping the circles as randomly as I could on the walls. I really liked how fun everything looked and how easy and cheap it was. S loved everything. She loved playing with her friends, opening her presents, and eating her M and M's. She had quite a haul. I can't wait to see what next year's party theme will be. S, K, and the banner Grandpa made. Very cute ... I love your use of the bright primary colors! 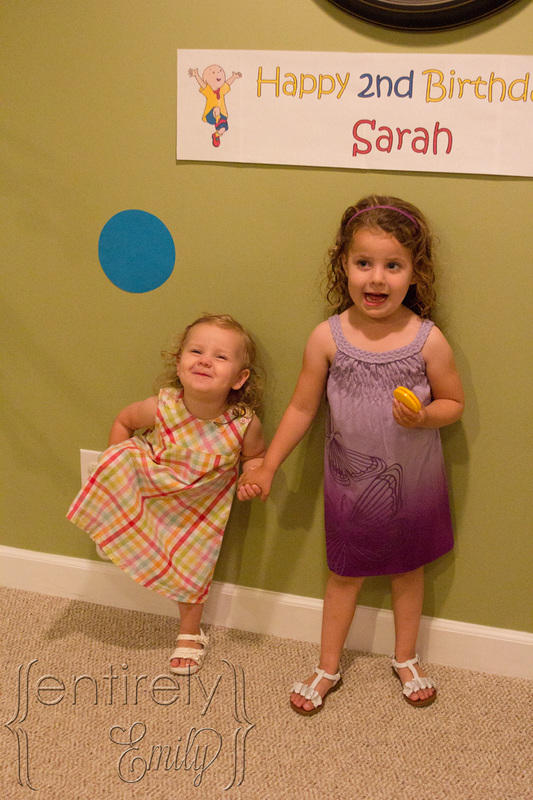 I love theme parties and playdates! Thanks, Randi. Our kids parties sure are fun to do.. More for me then them I think sometimes. This is so cute. I love your idea of just making the invitations as a picture file and then having them printed at a drugstore. That is such a great, cheap alternative to ones bought off of party sites. Thanks for the tip! Thanks! It is a really affordable way to do that or Christmas cards. What a fun party. 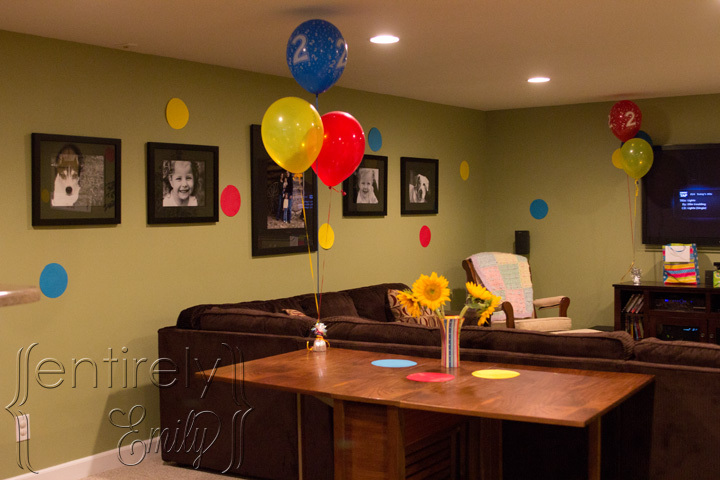 Love all the colorful dots on the wall! Thanks, Cassidy. I loved them too. So cute!! This brings back so many memories...my boys loved Caillou when they were little! I wish I would've done a party in this theme...how smart is that? Everything's adorable!! Thank you so much, Kristi. 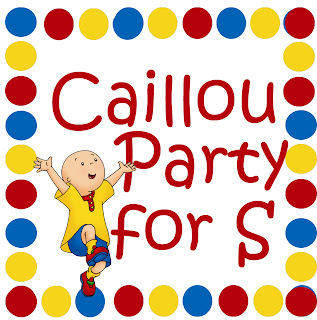 S can't enough Caillou. It would be Caillou morning , noon and night for her if I let it. At least it's a toddler friendly show. Thank you, Michelle. Yes..She had a great time and walked around pointing and saying "Caillou" the whole time. Oh my this brought back so many fond memories of this great show. Thanks for sharing with the newbie party. Looks like a fabulous and fun party. Thanks , Debbie. It was a great party and is always a great show. What a sweet little girl and party. My son used to really like Caillou too. 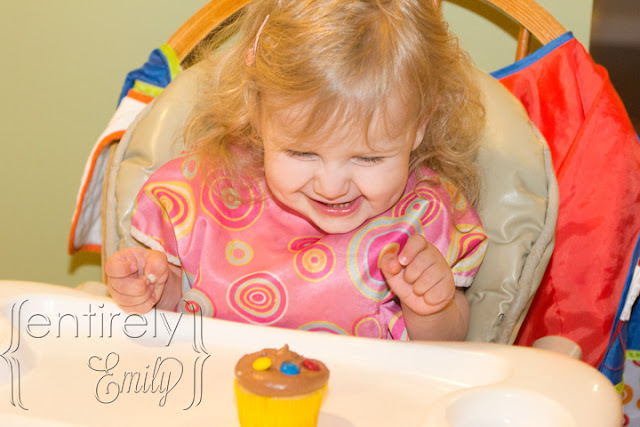 I would love it if you would stop by and share your party on Dare to Share. This is a very fun party theme. Looks great with the dots on the wall. :) Thanks for sharing this at Romance on a Dime!! Thank you, Betsy. I really liked the dots too. 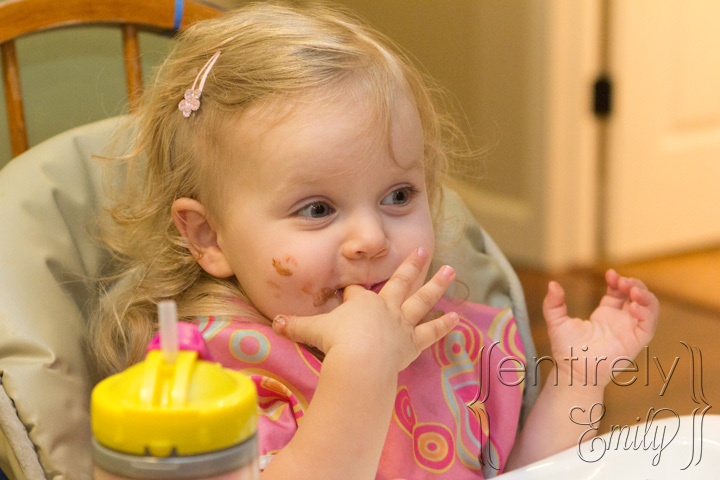 What a fun party for an adorable little girl! My kids also loved Caillou when they were that age...they are now 14 and 12. :-) Found you through Debbiedoo's Newbie Party. I'm happy to be now following. :-) Hope you have a wonderful night! Thanks, Sharla. I can't believe Caillou has been around that long. It is a cute little show. Thanks for following me and I'm following you right back. Great job!! 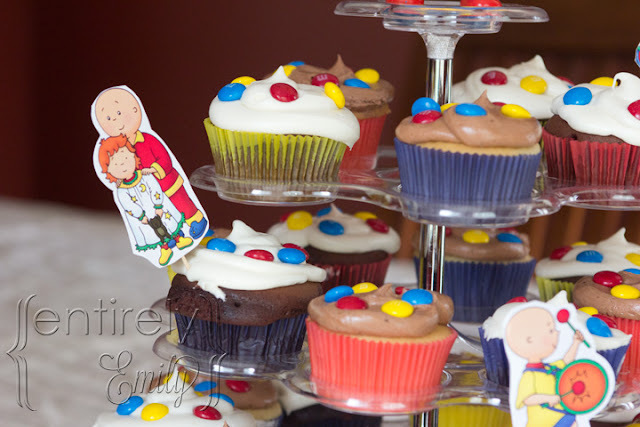 My daughter likes Caillou too...I may have to hold on to these ideas! I love doing 'themed' parties for the kids and had no idea what I would ever do if she asked for a Caillou party! Thanks, Monica. Please do hang on to them. It was pretty easy to do and made things look cute. I love your dinosaur tail. I would have to make two though for both girls. What a great looking party! Thanks for linking up! Thanks for having me , Melissa! How cute! My youngest son loves Caillou too. I remember making everything for my oldest son's Blues Clues party years ago. It sure does save money to make things yourself. Great job...looks like your daughter loved it. I saw your link at the Freedom Fridays party. Thanks, Shasta. It sure does. And you just feel better knowing you made it look your way and not the party company's way all the time. How sweet is she??? 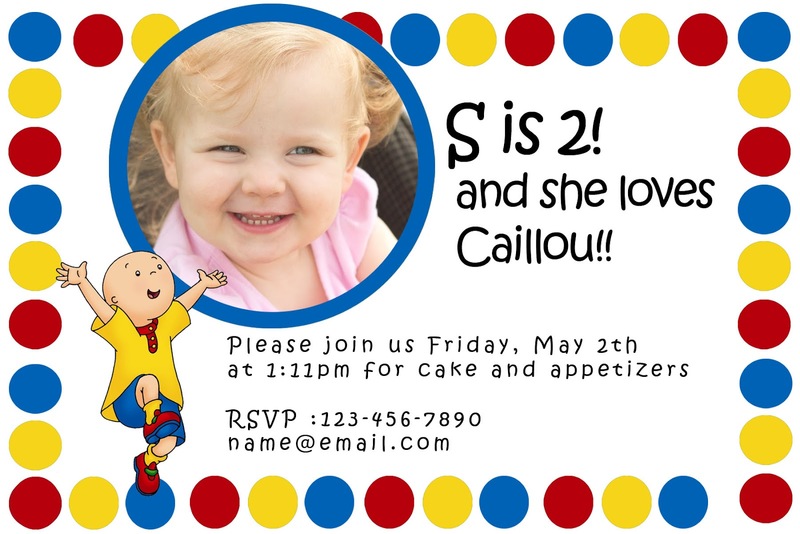 Yes, my granddaughter loves Caillou also! I have watched many an episode with her. Love the bright colors! Thanks for linking up to Freedom Fridays. Hope you are having a marvelous weekend!! 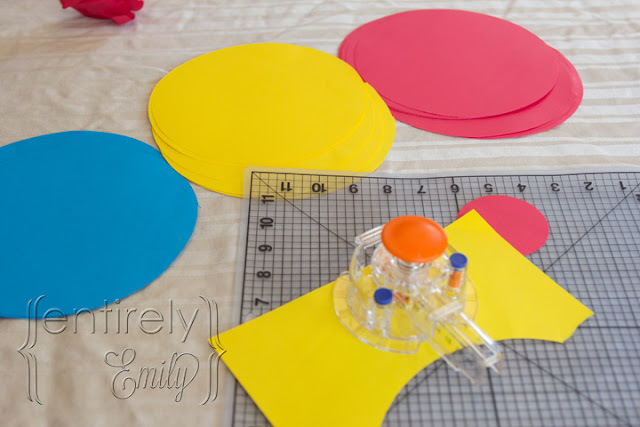 My 6 year old still loves Caillou and now I will be singing the song in my head ;) This was super cute and super easy to do on a budget. Thanks so much for sharing with us at Toot Your Horn Tuesday. Thanks, Debbie. I know...the song.. I catch myself singing it by myself. Thank you. I'm glad to know that Caillou is loved all over and not just our house. 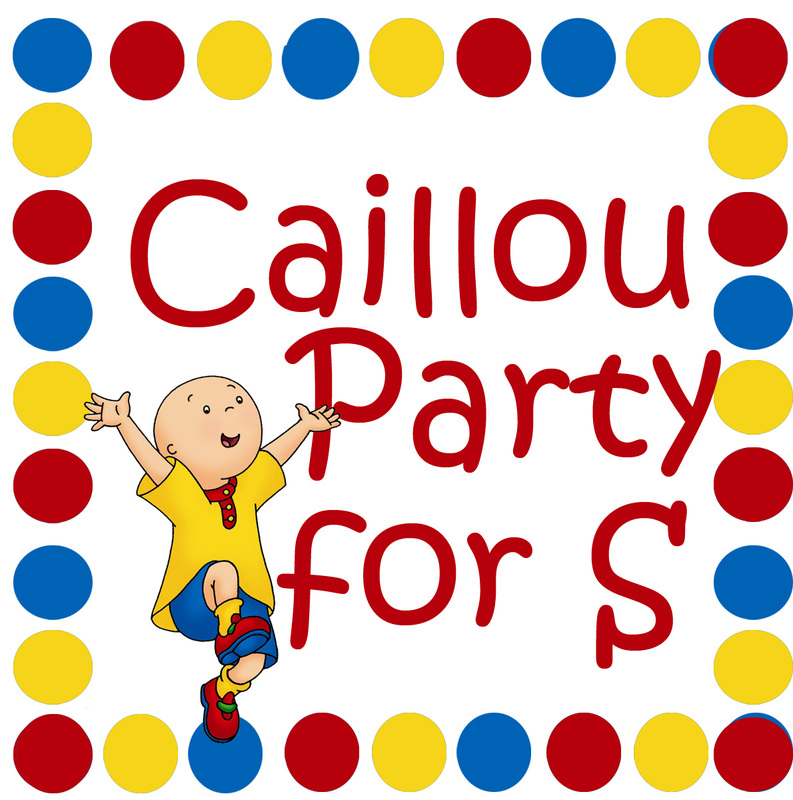 Hi Emily- I found your blog when doing a search for Caillou party stuff. What a great party. I would love it if you'd be willing to share the invitation file with me. email is whilina1782@yahoo.com. Hi. Found this on pinterest while looking up ideas for my son's birthday. I was planning Thomas but now with all these ideas I think I have changed my mind. He loves Caillou and would love to watch it all day on Netflix. I would love to have the invitation file. My daughter who is also turning 2 loves Caillou also. I have decided to make her theme caillou also. I would love if you share your invitation. I love all your suggestions. Hello! We are headed for a Caillou party for my son's birthday in Feb...the dots remind me of his first when we did a ball party...dots were sooo cute...and cheap! Would u mind sharing the invite?